AccessComputing has been awarded funding from Google to host a workshop for undergraduate women with disabilities in computer science to explore research careers. The exploreCSR (Computer Science Research) grants from Google will support universities running CS research-focused workshops for undergraduate women modeled on and inspired by Carnegie Mellon University's OurCS. 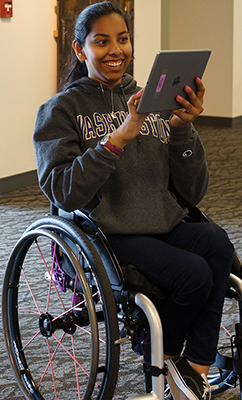 As part of the award, AccessComputing will host a workshop for women with disabilities in computer science from across the country in Spring 2019. Students will participate in group research projects and hear from mentors about current research. Learn more about the award and sign up to receive updates for when the application will be open.